A high performance DoSern9B9El.pngDDoS load analyzer built on top of multiple packet capture engines (NetFlow, IPFIX, sFLOW, netmap, PF_RING, PCAP). What can we do? We can detect hosts in our own network with a large amount of packets per secondern9B9El.pngbytes per second or flow per second incoming or outgoing from certain hosts. And we can call an external script which can notify you, switch off a server or blackhole the client. 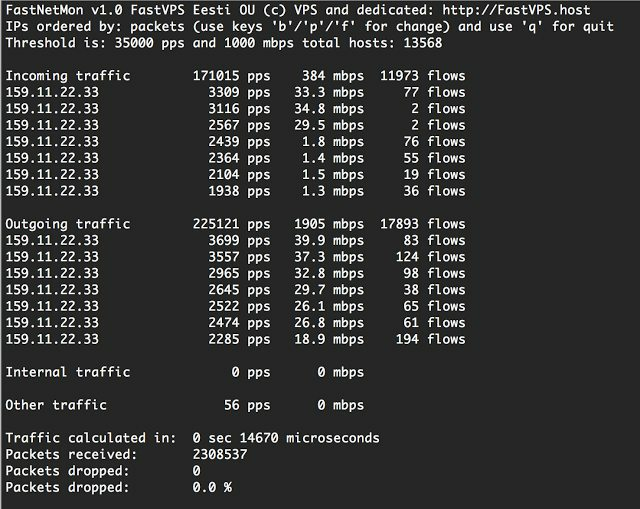 What is “flow” in FastNetMon terms? It’s one or multiple udp, tcp, icmp connections with unique src IP, dst IP, src port, dst port and protocol. To enable sFLOW simply specify IP of server with installed FastNetMon and specify port 6343. To enable netflow simply specify IP of server with installed FastNetMon and specify port 2055. Why did we write this? Because we can’t find any software for solving this problem in the open source world!